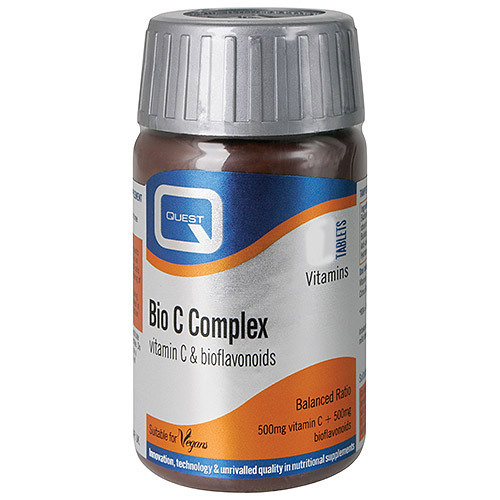 Quest Bio C Complex - 700mg Vitamin C is a vitamin C supplement that provides an equal balance of vitamin C and bioflavonoids. Bioflavonoids are plant pigments that support circulatory health; in nature they are found in vitamin C rich foods. Vitamin C helps maintain a healthy immune system and is required for the production of collagen, the most abundant protein in the body. Why use Quest Bio C Complex? Vitamin C (with hypromellose), Citrus Bioflavonoids Complex (Citrus Powder, Calcium Sulphate, Cellulose, Stearic Acid, Magnesium Stearate, Guar Gum), di-Calcium Phosphate, Bulking agent: Microcrystalline Cellulose, Magnesium Stearate, Anti-caking agent: Silicon Dioxide, Glazing Agent: hypromellosecellulose. 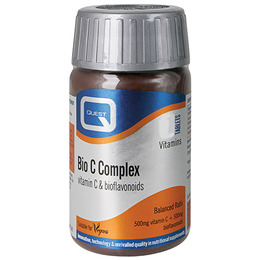 Below are reviews of Bio C Complex Vitamin C Supplement - 90 x 500mg Tablets by bodykind customers. If you have tried this product we'd love to hear what you think so please leave a review. Take this to help with my joints and skin condition. It seems helpful. Quest Bio C Complex - 500mg Vitamin C is a vitamin C supplement that provides an equal balance of vitamin C and bioflavonoids. Bioflavonoids support circulatory health and vitamin C helps maintain a healthy immune system.